My book provides readers with simple steps to consciously make parenting easier and more enjoyable. 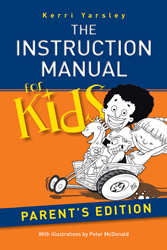 How much easier would parenting be if kids came with an instruction manual? Parents have been waiting for decades for the answers to the numerous challenges of parenthood. Kerri Yarsley shares her personal stories of more than 25 years of parenting along with valuable tips on happiness and health in her new book, “The Instruction Manual for Kids – Parent’s Edition.” Yarsley successfully raised her four children while working and staying actively involved in her community. ”How do you manage that?” people often asked her. As Yarsley started receiving more requests on help with parenting, she dedicated herself to writing this easy-to-read and entertaining instruction manual.